As a web designer, I certainly don’t have the experience and/or talent to criticize anyone’s work. As a web user, however, let me introduce you to one of the worst examples of web design*. Period! 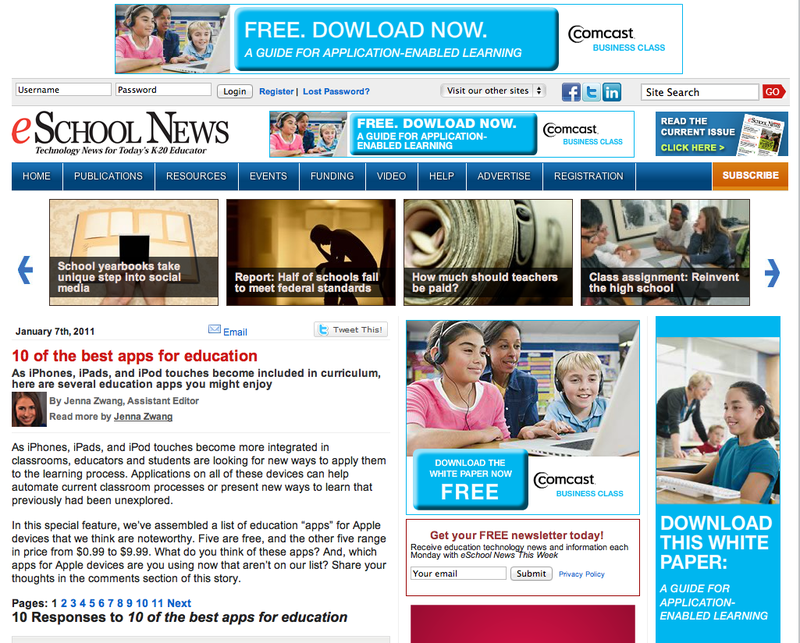 That’s an article called “10 of the best apps for education” from eSchool News. Except that it’s not the article. It’s the first of eleven “pages”, forcing a reader to click ten more times, with ten more page reloads, to see the full piece. There’s no good reason to segment a post like this, especially one so short. It’s simply a rather obnoxious technique some sites use (Time is one of the more high profile examples) to increase ad impressions. The owners are more interested in serving their advertisers than they are in providing information to their visitors. And speaking of ads, did you miss any of them? I counted seven large display ads on the page, along with many promotions for other things on the site. All of this non-contentÂ effectively minimizes the material you came to read. In fact, on most displays, this site has so much stuff “above the fold” that even the meager bit of content on the page is not fully visible. As to that content, it’s not even worth the effort of clicking through to get it. Half of the minuscule space allotted on each page is a screen shot of the app. It’s accompanied by a couple of sentences that offer very little about the functionality or instructional application, and nothing about why this particular item is better than competitors in the same category. Bottom line, the article was written (thrown together?) to attract viewers for the ads on the page, not to provide “technology news for today’s K-20 educator” as their mast (also lost in the clutter) claims. This is a great example of why I dropped eSchool News from my aggregator many years ago and finally connived them not to send the paper version. Not only is the material presented poorly, the over emphasis on ad impressions makes it’s quality and objectivityÂ suspect as well. *If you don’t want to add to their statistics by actually visiting the page (or if they’ve recycled the electrons into another article), click the image to see the page clip full size.